It’s probably caught your attention; smartphones have started to ditch the famous 3.5mm audio jack. Unfortunately, in its place, the latest iPhones have just one single Lightning port. It’s a change that puts iPhone fans into a tough position. The reason why mp3 players went the way of the dinosaur is because smartphones took their place; people like listening to their music on their phone. And when you’re trying to charge your phone and listen to music at the same time, having only one port can be a big problem. The bad news is that due to how Thunderbolt infrastructure works, phones in the foreseeable future will continue to have only one lightning port. The good news is that the underlying Thunderbolt technology is powerful and ubiquitous enough to be run through a splitter in ways that can’t be done with similar technologies. Like a standard USB connection, the Thunderbolt port is good for carrying both electricity and data through one cable. Thunderbolt takes the same idea to the next level, which makes it an optimal format for running a splitter. But adapters aren’t as simple as you might think. Anytime you’re taking one signal and converting it to another, there’s the possibility of signal degradation. When the data output has to match a very specific format, as Apple devices are known for, the adapter needs to accommodate a variety of different operating systems. That means you may find an adapter that works great for iPhone 7s, but doesn’t work at all for a more recent phone. No matter what types of devices they connect to, any good splitter has a handful of qualities that are easy to identify. When you’re looking at cord-based adapters, it’s important that their construction uses a sturdy, thick cord. The thickness of the cabling is almost all protection that stands between your adapter and a short. Additionally, cord length can be important if you’re connecting several peripherals together, like your phone with a battery bank. The essential physical portion of an adapter is the metallic plating on each end of the connection. That plating will either be resistant or vulnerable to corrosion, depending on how it’s been made. The head of the connector itself is another thing to notice. Bulky connection heads can mean you may have to remove your phone from its case to make a connection. That seems like a small problem, until you’ve been forced to remove your phone from its case for the 800th time. Often times, adapters do more than people give them credit for. In the case of moving an audio signal, you’ll want to make sure the adapter you use won’t bottleneck the performance of your headphones. If you’re the owner of some high quality Apple headphones, choosing the wrong adapter could mean your sound quality is choked, or some of the features of your headphones lose their support. The first thing to get out of the way about this adapter is compatibility. 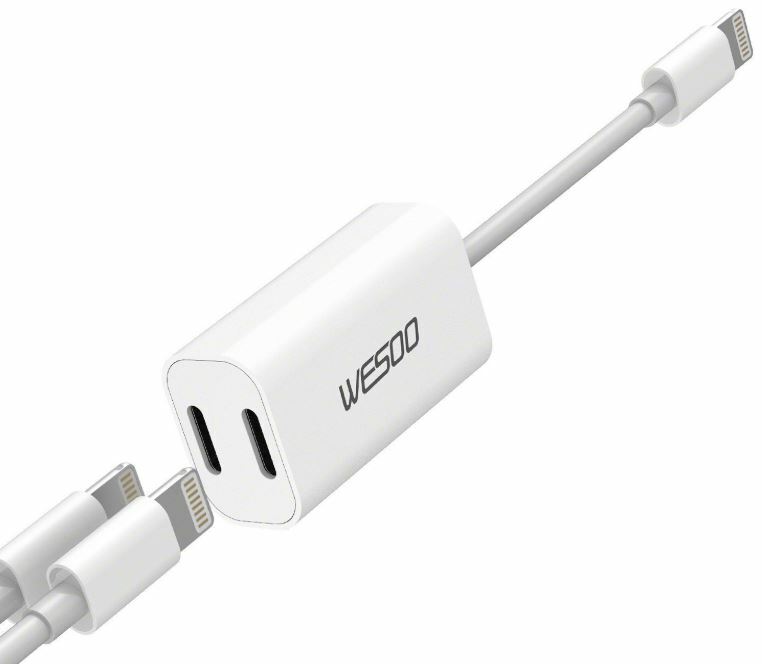 The Wesoo adapter is compatible for iOS 11 and up. That allows this adapter to fully support the iPhone X, iPhone 7, iPhone 8, and their iPhone+ counterparts. Its plug and play design doesn’t require software installation, and doesn’t waste your time with making a connection. Better still, it works with Apple products like Lighting EarPods, which helps ensure you can keep using both remote and microphone support. Internally, Wesoo’s adapter is composed of 100% copper, which is an inexpensive but highly effective material for sound fidelity. Its braided copper shielding is covered with a white TPE jacket that matches the Apple aesthetic. The entire adapter weighs about 18 grams, which is about the same as the weight of your phone’s case. The cord stretches just short of four inches, making it extremely portable, but not much for helping you reach between several devices. From a technical perspective, it’s nice to know this adapter supports a 48KHz, 24-bit audio. For portable devices like an iPhone, that’s the best audio quality that you’ll ever need. And it’s more than enough for maintaining the quality of your audio for people who use higher quality headphones. If you’re not familiar with those technical specifications, all you need to know is that this adapter will never be the bottleneck in your equipment. Anyone who’s used iTunes for a few years can tell you that it can be picky about when it allows you to make connections. But Wesoo allows you to sync through iTunes without unplugging the adapter, and it’s those kind of small details which add up to an overall strong ease of use. Its continued support for premium Apple features, like microphone and remote support, only extend its value. The end of the adapter is slim enough that it works with your phone case on, so you don’t have to worry about making a connection. Additionally, this splitter can be made to partner with a 3.5mm AUX jack. 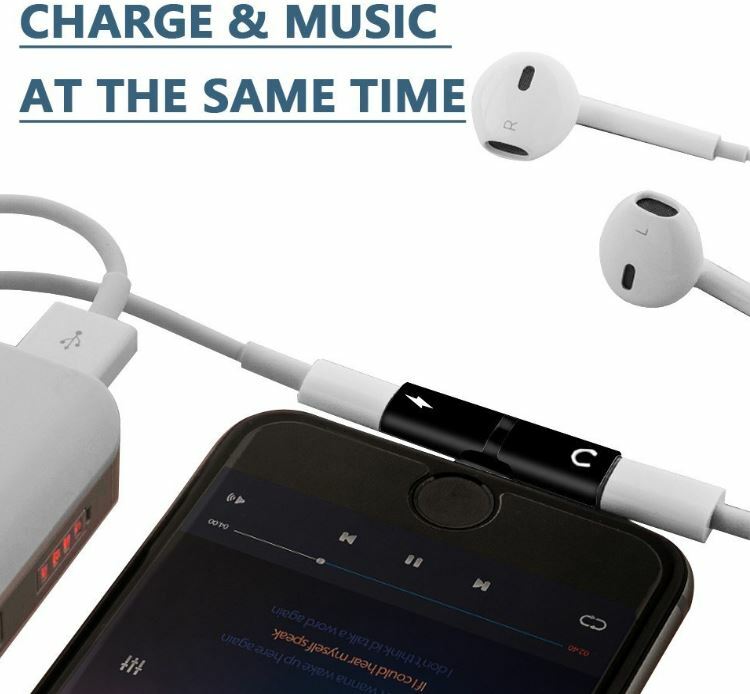 That means you can listen to music in your car while your phone is charged, or pair with another adapter for using your old 3.5mm headphones. The CaseyPop splitter is another two in one adapter, intended to be used with the most recent iterations of the iPhone. That includes the iPhone X, iPhone 8, 8+, iPhone 7, and 7+. Like you want from any splitter, this design lets you listen to music as you charge. 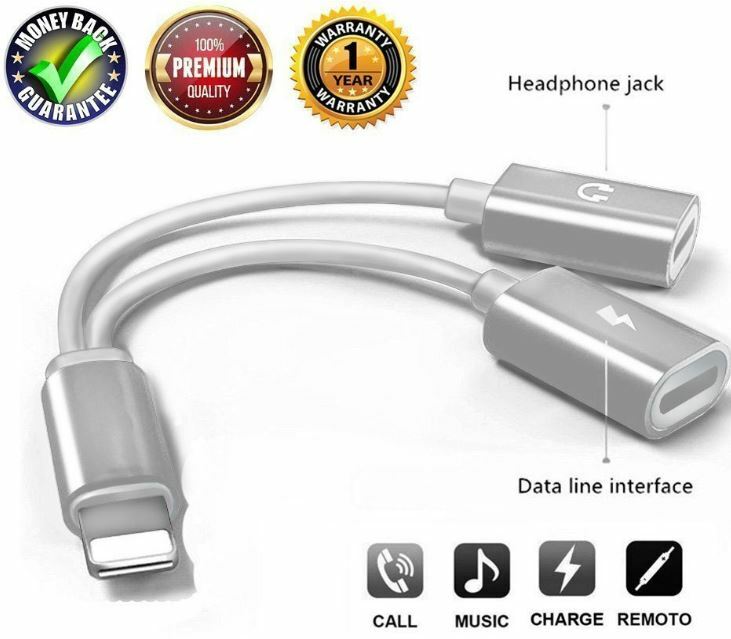 But unlike many splitters, this adapter is made from aluminum, which enables more efficient signal stability, and speedy charging for your mobile devices. CaseyPop’s adapter uses a cable which stretches a reasonably long 5.1-inches. When you’re dealing in a scale of inches, 5.1” is somewhere in the middle for portability. That’s more than enough distance for connecting a number of devices comfortably, even if one of those devices is a large Bluetooth speaker. Even for connecting a larger battery bank, you’ll have no problem making everything fit comfortably. And that 5.1” length is paired with a tiny 0.3-ounce weight, meaning this adapter could spend out its days in your pocket and you’d never notice. On the end of each connection, the two separate wires from the main connector are clearly labeled. The first wire is labeled with a headphone sign, which most people won’t have to rely on the user manual to decipher. The line-in cable is just as intuitive. And combined, they support the same 24-but 48KHz audio standard that you want any good adapter to live up to. Another detail to note is the slim profile for the connection head of each cable. That slim profile makes it easy to connect to a number of devices, even if they’ve got a protective casing on, like your smartphone case. Using the adapter is as simple as plugging in your headphones and charger into the adapter, and then connecting the splitter to your phone. If you’re also making use of a USB adapter, you’ll want to observe the same plug-in ordering. Aesthetically speaking, CaseyPop’s silver-white design doesn’t closely match Apple, but it’s not a stark contrast by any means. This adapter was rather clearly made to be paired with Apple products. For charging your devices, you can’t do any better. This adapter uses a 2a input, which can help you achieve a rapid charge even on devices with larger batteries. But it’s worth noting that this adapter doesn’t support data transfer, and isn’t compatible with 3.5mm aux headphones. As far as a warranty goes, CaseyPop offers a non-specific promise to assist you if you encounter a problem. 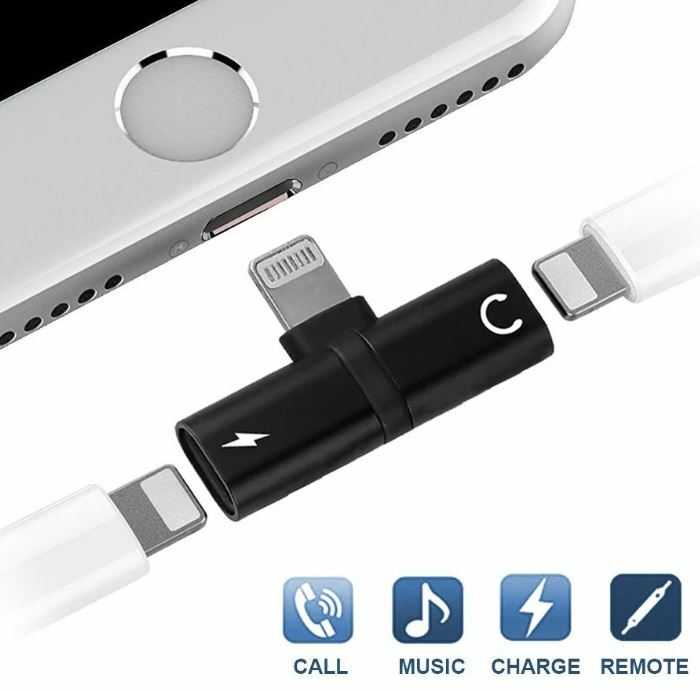 That’s more than nothing, which is what you’ll find from plenty of lightning splitter adapters for iPhones. The Urgod splitter is compatible with any recent version of iOS, providing support from iPhone 7 through iPhone X. That wide range of compatibility is paired with the common sense features you’re looking for from a splitter. 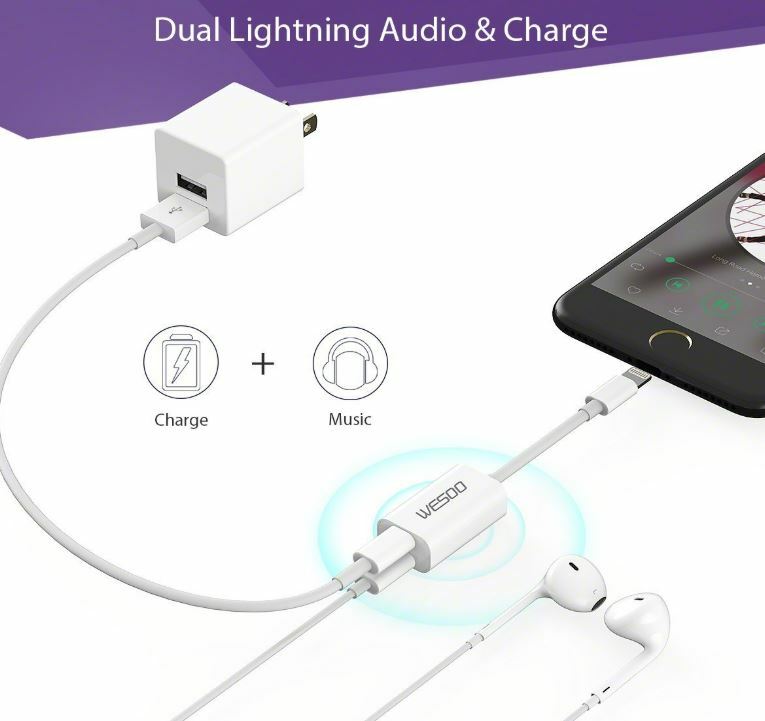 It allows you to listen to your phone while you charge it, and split your connection up into several devices. But unlike its wire-based competitors, Urgod has something unique up their sleeve. This adapter has somewhat novel design. Physically speaking, it roughly resembles a USB thumb drive. When you plug it in, it sticks out from its host as if it were a flash drive that had been installed sideways. This 90-degree orientation makes it exceptionally easy to attach a number of different devices together from one hub, without the added bulk of cabling. And that lets you play games and movies without dealing with messy cable connections. This splitter supports both 48KHz and 24-bit audio, which keeps Apple earphones sounding their best. Each end of the device is clearly labeled, one end for headphones, and one end for charging. It also has the data pass-through necessary for a 3.5mm AUX connection, so you can listen to music in your car. And the cordless design makes those kinds of connections extremely easy. The Urgod lighting splitter adapter can offer support for Apple lighting headphones, including their remote and microphone features. 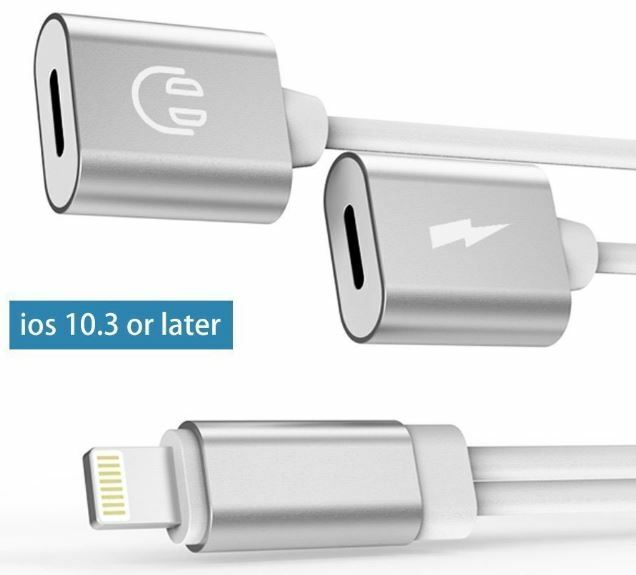 While this adapter was clearly designed for Lightning EarPods, it’s also usable with any number of similar headsets. Although Urgod isn’t exactly a household name, they do offer a full 1-year replacement warranty. They also promise 30-day returns for any reason, and 24/7 technical support for life. Ease of use is about what you’d expect from a plug-and-play device like this. Even though some devices with this form factor will prompt you to install drivers or otherwise put hurtles in your way, Urgod’s adapter is burdened with none of that. It’s no more difficult than using a wire-based adapter. In most cases, you won’t end up needing a cord-based adapter. Apart from the phone this adapter directly jacks into, everything you’re connecting with will have a cord of its own. Unless you end up needing the extra cord length that only those kinds of adapters can provide, you can expect to encounter no problems with connectivity. 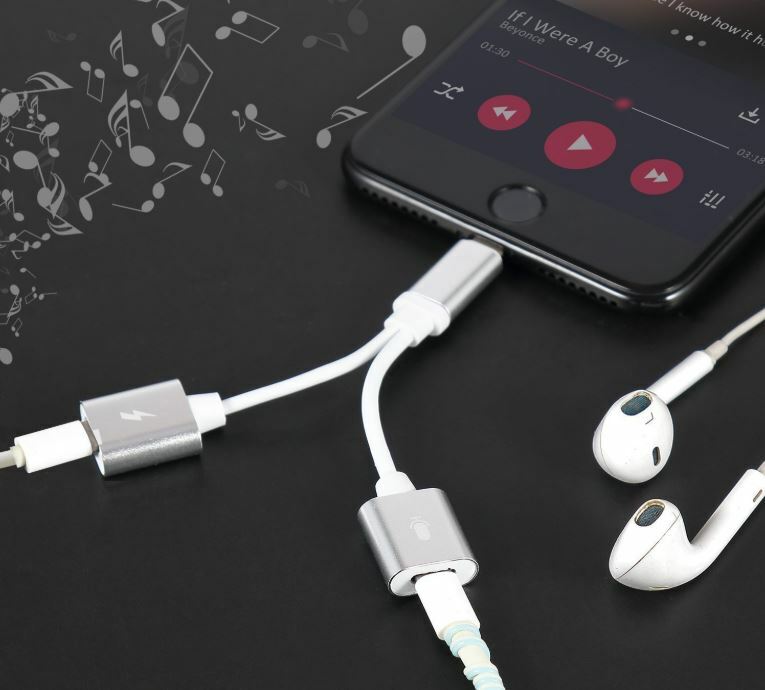 The CaseyPop 2-in-1 Lightning Splitter is inexpensive, yet offers all the power you need to operate excellent headphones. It’s aluminum-based construction and 2a input capabilities make it a perfect choice for people who prioritize getting a speedy charge. For charging the larger batteries you’ll see in iPhones and tablets, you can see drastic improvements in speed with this adapter. 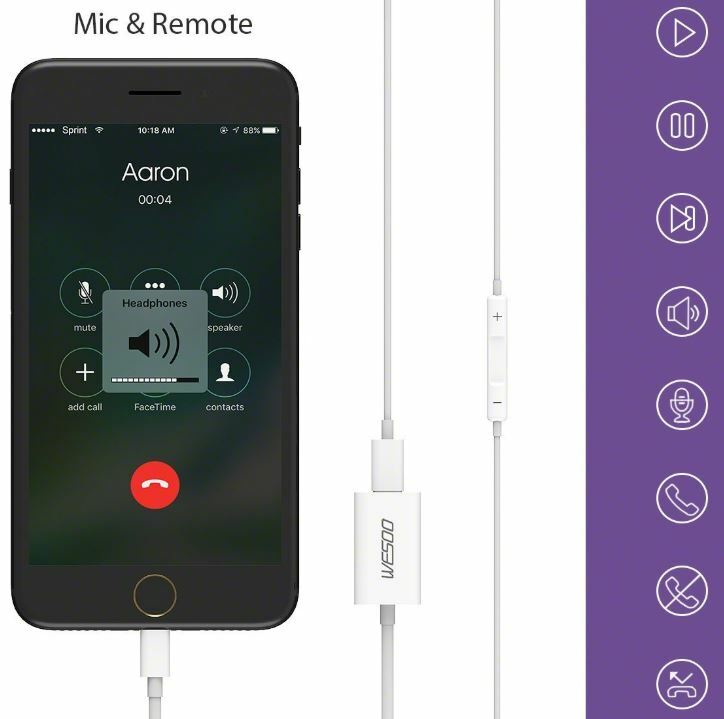 CaseyPop’s adapter is also the go-to choice for someone who needs a lengthy cable, which can better facilitate the connection between your devices. By contrast, the Wesoo adapter has rigorous native support for many of Apple’s best features. It’s a great choice for anyone who uses a pair of Apple headphones. Unfortunately, some people experience issues with older versions of iOS, especially people using the iPhone 7. If you’re using an older iPhone, it can be a gamble whether or not this splitter will work for you. But if you’re using a more recent iPhone, you’ll appreciate how the Wesoo Lightning Splitter adapter neatly matches Apple’s high-end aesthetic. What you make of the Urgod adapter will ultimately depend on what you think of the cordless design. Some people will love that the cordless design makes this adapter is almost invisibly small, and all-but-immune to the kind of wear-and-tear forces which end up killing adapters. But whether or not it’s a viable solution for you will ultimately depend on if you need the added distance you get from a few inches of cabling. 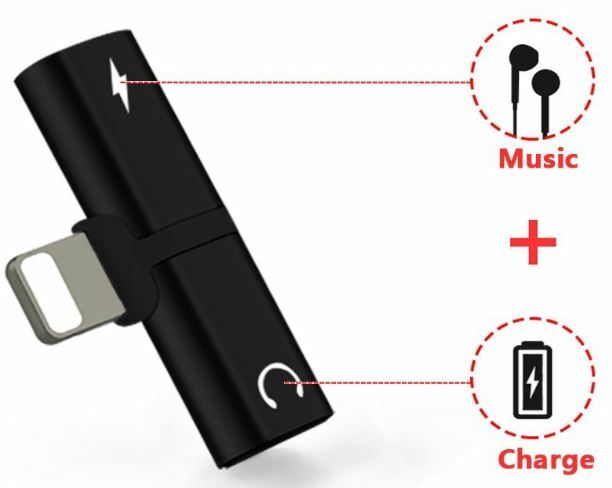 That makes Urgod’s splitter a great choice for people who want to bring music into their car, or similar circumstances where having a cord only makes things feel cluttered.